The Amboró nature reserve covers 637,600 hectares, divided into 2 categories: National park with 442,500 hectares, and a natural area with limited agricultural use of 195,100 hectares, the park has differences in height from 300 to 3,200 meters in altitude. Amboró is located in the provinces Manuel Maria Caballero, Ichilo, Florida and Andres Ibañez, it comprises 9 districts: Comarapa, Buena Vista, Samaipata, Yapacaní, San Carlos, Mairana, El Torno, Pampa Grande y Porongo. It is the area where the river basins of the Rio Grande, Ichilo, Yapacaní and Piraí emerge, each of them connected with the Amazon. Amboró has an average annual temperature of 12º C. in the south and 24º in the north, with rainfall-range: 500(n) to 4,000 mm (s). 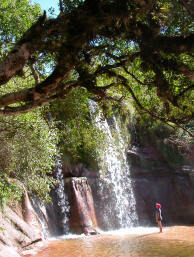 In this zone meet 3 geographical and biological dimensions: the Andes, the Amazon and Chaco. That is why there are 26 different vegatation-areas and about 3,000 plant species registered, although there might be even more than 3500 species....Up till now, 109 species have been found, many of probably endemic or exclusive in this region. Also, 76 Amphibian species has been found of which half of them in Bolivia existing "Anuros" (frogs without tail); 9 of them are endemic .. The Amboró park features 105 reptiles, half of the country Reptile species; 4 are also endemic. It has one of the highest numbers of birds in Latin America and represents with about 900 species, 60% of the species in Bolivia. 9 are endemic and 7 are threatened with extinction. 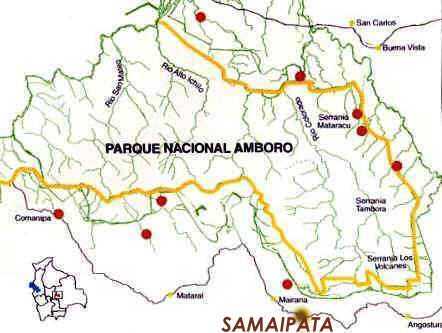 Amboró is Bird migration area for 28 bird species from the north and 8 from the southern Hemisfere. 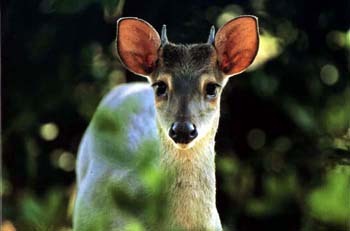 Amboró counts with 127 species of mammals, and preserves Dinosaur remnants. Approx. 18,000 people live in surrounding areas of Amboró, united in more than 80 communities, highly dependent on the use of natural Resourses for survival. The dangers threatening the Amboró are the direct use of these natural Resourses; the exploration of mining and oil companies; the development of dis-organized ecotourism; and the settlement of colonizers from the higher region of Bolivia.